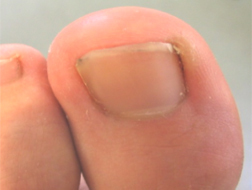 Having numbed the toe with a local anaesthetic a small strip of nail is then removed from the affected side(s) of the nail plate with the corresponding piece of matrix (root). Phenol is then added to prevent the removed matrix from reforming; this will ensure the strip of nail that has been removed will not re-grow. In effect the nail is made slightly narrower than it was. A PNA is an alternative to removing the entire nail (Total Nail Avulsion). In an otherwise healthy toe nail it would be an act of unnecessary vandalism to remove the entire nail unit when the ingrowing toe nail can be cured easily by just removing a small strip of nail! It would be exceptionally rare for our patients to experience any significant discomfort following a PNA. We would normally ask patients to avoid any excessive weight bearing activity for the remainder of the day, normal daily activities/work can resume the next day. Healing will take 3-5 weeks although over this period of time it will not impact significantly on our patients daily routine and will not prevent our patients from bathing, swimming, and engaging in sports (except the first 3 days). The fee for a PNA is £225, this includes all follow up dressing appointments and the provision of all the dressings required. Mark Hollinshead is our Practice specialist for Ingrowing toe nail/Partial Nail Avulsions. Mark set up and ran a Nail Surgery Unit for 11 years within the local NHS Community Trust over which time he undertook over 12,000 Partial Nail Avulsions and thus can offer his patients unrivalled experience and levels of efficacy in the field of Nail Surgery. “I suffered from ingrowing toe nails all my adult life and have spent the past twenty years trying to gouge them out. The procedure was totally painless and i was back at work the next day. After only a few weeks you couldn’t tell the procedure had been carried out. I now have two completely painless and maintenance free big toe nails and i’m absolutely delighted with the results.